Are you preparing to take the Pathology Final Exam in Respiratory Therapy school? If so, good, because you have definitely landed on the right page. That’s because, below, you can get access to our study guide that lists out a variety of practice questions covering a wide range of topics about pathology and all of the diseases in Respiratory Therapy. Now of course, each and every Respiratory program is different, but still, this study guide will serve as a fantastic review for everything you learned throughout the semester concerning Pathology. So are you ready to get started? Below you can find all of the practice questions that can help you prepare for your Pathology Final Exam. If you want the correct answers as well, you can get them (free) by Clicking Here. 1. A 56-year-old patient arrives to the ER with extreme shortness of breath. Upon observation, you note that the patient has an increased AP chest diameter, using accessory muscles and pursed-lips to breathe. The following ABG results are available. Based on this data, what treatment would you recommend? 2. A 74-year-old man with a long history of emphysema and chronic bronchitis enters the ER in respiratory distress. His RR is 34/minute and labored. His HR is 115/minute and BP is 170/120. What is the clinical interpretation of the following ABG (in addition to hypoxemia)? What treatment would you recommend for this patient? 5. In which of the pulmonary disorders would you expect to see a faster respiratory rate and decreased tidal volume? 12. Guillian-Barre is which type of dysfunction? 13. Hepatomegaly, jugular venous distension, and a right ventricular heave are consistent with what clinical condition? 14. How far above the carina should the tip of the endotracheal tube be seen on the chest x-ray? 15. Increased resonance to percussion is associated with which of the following conditions? 17. It is best to hyperventilate a ventilated patient with a head injury. This helps by producing _______________, which in turn will result in _______________ and reduce the ICP. 18. Oxygenation failure is present when the PaO2 falls below what value despite a FiO2 of 50%? 19. Which of the following are initial treatments for a patient who presents to the ER with the diagnosis of an overdose? Which of the following lab values is most important in assessing this patient’s oxygen-carrying capacity? 24. What change in the patient’s vital signs is expected as a result of fever? 25. What clinical condition is most closely associated with harsh bronchial breath sounds over the affected region? 26. What clinical condition is most likely to produce coarse crackles? 27. What condition is often associated with abdominal paradox? 28. What is the correct interpretation of the following ABG values ( in addition to hypoxemia)? 29. What method of weaning helps the patient overcome the workload imposed by the resistance of the artificial airway? 30. What term is used to describe shortness of breath in the upright position? 31. What term is used to describe sputum that appears to contain pus? 32. What term is used to describe sputum that is clear and thick? 33. What term is used to describe the lateral curvature of the spine? 34. What test is most useful for evaluating renal function? 35. What treatment alternative is most appropriate when the patient’s ventilation is adequate and the problem with oxygenation is likely to resolve quickly? 36. What treatment alternative is often needed when the patient has refractory hypoxemia due to shunting? 37. What type of white blood cell is most responsible for responding to allergic reactions? 38. What type of white blood cell would most likely be elevated if a patient had an acute viral infection? 40. When lung compliance decreases as in restrictive diseases, which of the following is seen? 41. Which of the following are acceptable methods for weaning patients from mechanical ventilation? 42. Which of the following best describes a patient being treated effectively for a shunt-like effect? 43. Which of the following characteristics is typical for Pleuritic chest pain? 44. Which of the following clinical findings would be associated with a patient diagnosed with COPD? 45. Which of the following conditions is NOT likely to cause hemoptysis? 46. Which of the following conditions is most likely to produce a dry cough? 47. Which of the following conditions is most likely to produce an abnormal white shadow on the chest x-ray? 48. Which of the following parameters is most indicative of the patient’s tissue oxygenation status? 49. Which of the following represents compensated metabolic alkalosis? 50. While listening to a 53-year-old-male patient, the RCP notices that the patient has a S3 galloping heart sound. This could be caused by which of the following? 51. While reviewing a patient’s chart, the respiratory therapist notices the patient’s Hb level is 11g/dL and the SpO2 is 88%. Which of the following is true regarding this situation? 52. While reviewing the chart of a patient with lobar pneumonia, the respiratory care practitioner notices that the respiratory rate for the last 24 hours has been between 28 to 42 /min on a 50% venturi mask. Which of the following most likely caused the increased respiratory rate? 56. Your patient has been living at high altitude for several years. What lab result do you expect? 57. Which of the following represents a normal Albumin level? 59. Which of the following describes an intrapulmonary shunt? 60. Inverse I:E ratio ventilation is a strategy sometimes used to improve oxygenation in which of the following disorders? 61. A patient comes into ER with slow, shallow breathing and is slow to arouse. What should be done first? 62. All the following are opioids except which of the following? So there you have it. I hope that this study guide was a great review for you for your Pathology Final Exam. 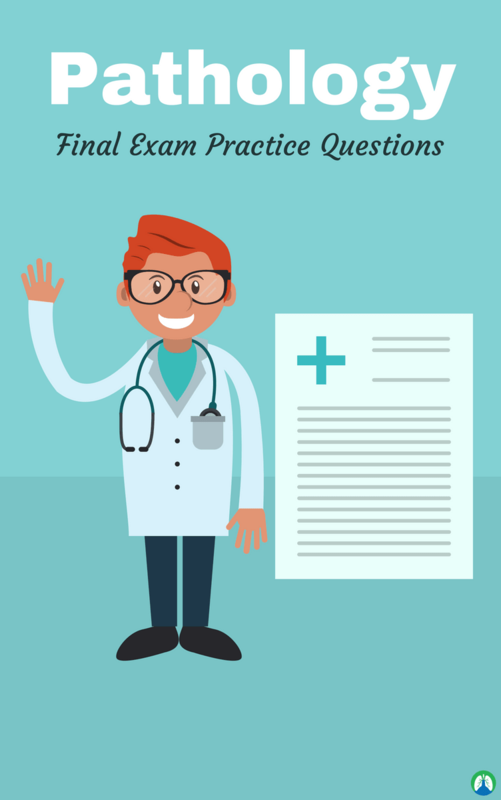 As I mentioned before, I realize that each Respiratory Therapy program is different, so I may not have included a question about every single topic that you’ll see on your final exam. Still, if you go through this information, I have no doubt that you can boost your knowledge and improve your score at the same time. 🔒And if you need the answers to these questions, you can get access to them by Clicking Here.